Perhaps as an educator, you’ve noticed the same thing we have at boclips, that the traditional model of teaching is being changed as it applies to the ‘Netflix generation.’ Furthermore, the acceleration of digital materials replacing print in the education market has resulted in education providers and instructors rushing to keep up with the demand for video in the classroom. With the change in teaching models and the endeavor to keep up with relevant materials that are engaging and available for students, we’re proud to announce that PBS Digital Studios is the most recent content partner to join forces with boclips. "The use of YouTube videos in education provides educators with an invaluable resource which helps to enhance the learning experience for their students. Video content is absolutely one of the best educational resources available in the world today. With that being said, it's such a shame when engaging and inspiring content is blocked in schools because of the advertising and inappropriate content that comes with it. 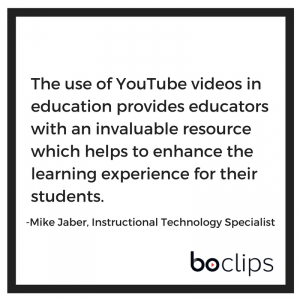 It's so great to see boclips offering a solution that works for educators so ALL educators can use a video platform that is vetted and fully educationally based!" For additional information regarding the latest content partnership, please read the press release in its entirety. Our platform will be available on a beta trial basis to teachers around the world in the fall.